The field of marine historical ecology developed from the fundamental observation that marine ecosystems had been changed by human actions long before scientists began to study them. My work in this field has used novel methods to evaluate century-long changes in the abundance, distribution, size, and species composition of a suite of marine animals, including invertebrates, fish, reptiles, and mammals. This research involves compiling previously unused historical data--including photographs, newspaper articles, restaurant menus, and customs records--and incorporating them into ecological analyses. The results describe changes to population structure, ecosystem state, and energy flow in marine ecosystems farther back in time than was previously possible and provide novel understandings of ecosystem function in the absence of pervasive human influence. My current historical ecology work focuses on understanding historical biogeographic patterns of large marine animals, which are an essential but often overlooked component of long-term population dynamics and conservation assessments. I am also keenly interested in how to employ knowledge of past ecosystems toward endangered species recovery, sustainable fisheries, and ecosystem restoration, as well as ways in which the past can provide insights into precedents for sustainable management and ecosystem recovery. The second branch of my research program addresses fisheries conservation, with a focus on the Gulf of Maine. Overfishing and climate change are the two most significant impacts on marine ecosystems, with the Gulf of Maine suffering from long-term overfishing and rapidly accelerating warming waters. At the same time, community-led habitat restoration and innovative models for fisheries management and seafood systems provide hope for species recovery and fisheries sustainability. All my work in this area has been undertaken collaboratively with undergraduate students at Colby College, and addresses the effects of climate change and reduced fisheries diversity on Maine’s fisheries, as well as the potential to restore local and sustainable systems of management and commerce for coastal communities. Published research to-date has quantified the ecological benefits of Community Supported Fisheries in North America, investigated the social benefits conferred by the restoration of habitat connectivity and historical alewife populations in Maine rivers, assessed the adaptive capacity of co-managed fisheries in the face of environmental change, and used choice experiments to investigate opportunities and barriers to fisheries diversification in New England and consumer support for fair trade fish. Ongoing work focuses on ecological and social effects of changing water temperatures over the past half century. 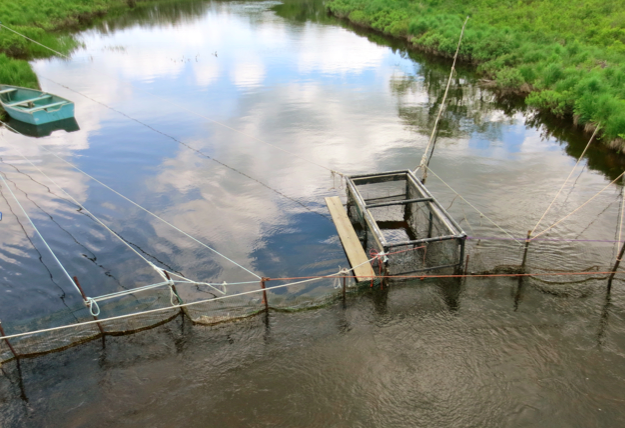 An alewife fish trap in Maine. Small scale and sustainable, Maine's alewife fishery demonstrates the social value of restoring historical ecosystems and fisheries. Global, regional, and local extinctions of marine species are often underestimated due to the difficulty of accurately detecting losses. My work in this area investigates patterns and consequences of past marine extinctions, extinction risk in extant marine species, and differences between marine and terrestrial species at high risk of extinction. It identifies key data gaps in the basic biological information essential to assessing extinction risk, and finds that large ranges fail to buffer extinction risk for marine animals as they do for terrestrial species. Ongoing work includes understanding the ways in which the loss of spatial complexity over long time scales can weaken the ability of marine and coastal species to withstand future threat, as well as the degree to which spatial structure in marine animal populations can predict recovery after regional extinction. While lessons from the land can be applied to reducing extinction risk in the sea, key differences between marine and terrestrial species suggest a more diverse suite of strategies is necessary for conservation of extinction-prone species in the sea. This work contributes to a growing understanding that extinction in the ocean is possible on a large scale without appropriate policy actions.